I was doing research for a paper on Medieval Ireland when I came across an article about an African slave in the United States in the 1700s. I still haven’t figured out why the article was mixed in with ancient Ireland, but I found myself quite intrigued with this young girl who invariably stole the hearts of all who knew her. She grew up to be America’s first black poet, and the first black woman to be published. That’s quite an accomplishment for a young girl sold into slavery at the approximate age of seven. 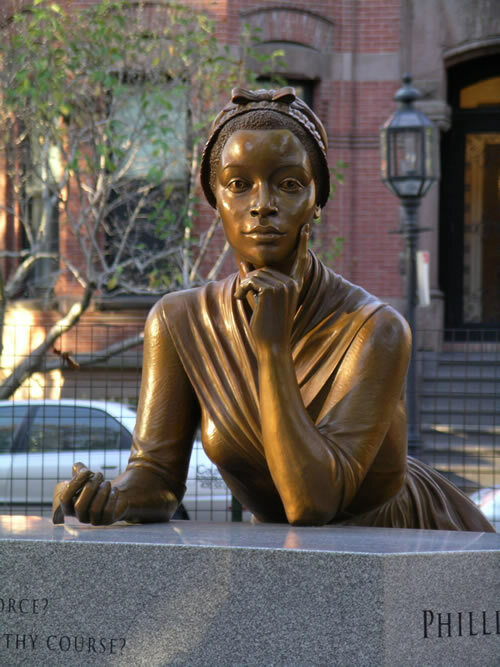 Thought by many to have been born in the Gambia / Senegal area of West Africa in 1753, Phillis Wheatley was named for the slave ship that carried her to America. Upon her arrival in Colonial Boston, she was purchased by John and Susannah Wheatley. Differing accounts list John as a tailor, merchant, and owner of much property, wharves, and a schooner. Whichever he was, he and his wife Susannah were immediately taken with the frail young girl and brought her into their Puritan home. Due to her fragile condition, Phillis wasn’t trained as a servant. Perhaps she would have been as she regained her health, but her life took a surprising turn. Less than a year-and-a-half after she was brought into the Wheatley home, Phillis had learned to speak and write English and read the Bible. Encouraged by Susannah after she was reportedly caught writing on the wall with chalk, Phillis soon began to study literature, poetry, religion, the Bible, and Latin. Amazingly accomplished for such a young girl, Phillis soon found herself the recipient of many admiring visitors – Susannah’s friends. Phillis began to write poetry when she was quite young and, in 1767 one of her poems was published in The Newport Mercury; a Rhode Island newspaper in business from 1759 – 1928. Some articles dispute her first year of publication, and the nature of the first published poem. The poem published in The Newport Mercury is said to be a tribute to sailors lost at sea. The other poem, which some say was her first published, was in memory of evangelist George Whitefield, whom Phillis and Susannah greatly admired. This was actually published in 1770, three years after her tribute to the lost sailors. This is just a short excerpt of the lovely poem that brought her international acclaim and caught the eye of Selina Hastings, Countess of Huntingdon. When Phillis was twenty years old, she accompanied the Wheatley’s son, Nathaniel, to England. It is said that she went there for her health, but she ended up having her first collection of poetry published with the help of the Countess – though they never actually met. The title of the collection is Poems on Various Subjects, Religious and Moral, and was published in 1773. 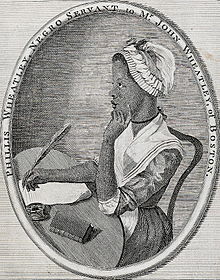 Like most writers, Phillis was unsure of how her work would be received, and in the dedication to the Countess, she wrote her hope that her “feeble efforts will be shielded from the severe trials of uppity Criticism.” Before the work was actually printed, Phillis had to return to Boston. Her dear Susannah was gravely ill. Shortly after Susannah died, John Wheatley gave Phillis her freedom and she married a man named John Peters. Phillis remained in fragile health, but continued to write poems. One poem was written, along with an anti-slavery letter, for George Washington, who praised her for her great talents. She had three babies; two of whom died shortly after birth. Phillis died at the age of thirty-one, and her third child died shortly thereafter. Once I redemption neither thought nor knew. May be refin’d and join th’angelic train. I hesitated to quote those last lines for fear of offending anyone. I praying that isn't the case, and if so, I sincerely apologize. They bring tears to my eyes each time I read them, and the power of this poem is not complete without them. Phillis was a deeply inspiring, admirable young woman who did not give in to her circumstances. As a child, she must have been very frightened when she was sold (perhaps kidnapped first) into slavery and journeyed across the ocean to a foreign land to be sold to people who spoke a totally different language. Through all of this, though, she recognized the giver of her talent. In turn, she used it to honor others and to honor God. 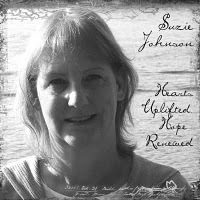 Suzie Johnson has won several awards for her inspirational novels (writing as Susan Diane Johnson), including the Maggie, Lone Star, Heart of the West, and Beacon awards, as well as finaling in the Touched by Love, Finally A Bride, Linda Howard Award for Excellence, and Virginia's Fool For Love contests. She is a member of ACFW, RWA, and is a cancer registrar at her local hospital. The mother of a wonderful young man who makes her proud every day, she lives with her husband and little kitten on an island in the Pacific Northwest. And although the beaches are rocky instead of sandy, lined with Madronas and Evergreens instead of Palm trees, and the surf is much to cold for wading, it is still the perfect spot for writing romantic fiction. You can visit her blog, Suzie's Writing Place at http://suzieswritingplace.blogspot.com/. ugh. I commented this morning on my Ipod and whoooosh. again it disappeared. well, this was really interesting for me Suzie. I had never heard of Phillis and it's an incredible story. Wow, such beautiful words. It always amazes me what accomplished writers many people were with schools being so different/ or no schools. I think there was a huge emphasis on literature. When you read things such as diaries of the common folk, it's inspiring. students were taught to use the language to evoke feeling. well, that's pretty much a thing of the past, huh? I am going to remember this woman and learn more about her. I want to visit the statue in Boston. so nice that you found her in your homework travels, Suzie! You're right, Suzie. Phyllis's story is at the same time inspiring and uncomfortable. But you have to let art speak for itself and this amazing woman to speak for herself. As I've been working on my American historical novel that's supposed to be fun and light, I can't avoid the slavery issue of that time either. My characters are on the side of emancipation, but they can't ignore the fact that life is hard for free blacks in the south either. Deb, and anyone else interested - her work is available on Nook for free. I'm not sure if it's the same for kindle, but it probably is. She's very inspiring to me. She only have one memory of her like in Africa, and it was of her mother pouring water from a pitcher. :( She totally touches my heart. I can't even imagine what it was like for her. Were her parents with her on the ship? Was she kidnapped from them? I'd like to learn more about her. That statue is totally awesome. it's so incredibly beautiful. I'd like to see it, too. Dina, I can't wait to read the book you're working on. I agree, it's such a tough issue. I know you'll deal with it in a tender and compassionate way. Thanks for validating me not messing with Phillis's art. To me, to quote only half of that verse would be doing her, and all people who were slaves, a disservice. I just read "The Call of Zulina" last week, definitely worth the read for a look at slavery from the other side. What an amazing story of faith and accomplishment, and in such a short lifetime! Thanks for sharing! BTW, I'm gonna have to put what she said about being shielded from the "severe trials of uppity Criticism" somewhere I can see it every day! Interesting post, Suzie. I wasn't familiar with her. I can only imagine what heartbreak she must have suffered in her brief life. Her story is, as Dina said, both inspiring and disquieting. I hope her story draws more attention to the horrors of slavery--which is still going on in the world. I'm glad you introduced me to Phillis. I had never heard of Phyllis until I read a book my agent Wendy Lawton wrote about her. What a great story!
" . . . but they can't ignore the fact that life is hard for free blacks in the south either." I think people often forget that prejudice didn't (and doesn't) stop at the Mason-Dixon line. There are and were prejudiced and not-prejudiced people everywhere. People up north weren't uniform in their ideas about slavery any more than people down south were. And often those who insisted on emancipation in the south were perfectly fine with the de facto slavery in some of the factories up north. It's not like black men and women escaped to the north and found they were suddenly treated as equals. They had plenty of challenges there, too. I haven't heard of The Call of Zulina. I'll have to check into it. I do suspect it might be a tear-jerker, though. I love that quote about criticism, too. I really felt a connection to her when I read that. The feelings we have today, the feelings they had then...so very similar. Hi Susie. Yes, I agree with Dina, too. Phillis's story is bittersweet. Even though she was educated and loved in the Wheatley household, and not trained as a servant, she was still a slave. And sadly ... oh, I didn't want to add anymore sadness to this story ... sadly, after she was given her freedom and was married, her husband didn't make a good living and she ended up working her fingers to the bone as a maid. DeAnna! Your agent wrote a book about her? I did not come across it in my research. Is it still in print? what is the title? Yeah, it's called Freedom's Pen. You can still get it from Amazon in paperback and on Kindle. It's more of a middle grade book, but I really liked it. Very cool, DeAnna! I will see if I can get it o n the Nook. I think it's awesome that middle graders are learning about Phillis. Sometimes I think I'd like to write historical books for kids. Fact-based fiction so they could get into the "skin" of the historical person. Is that an example of narrative non-fiction, Dina? Narrative nonfiction would be based as much in a real historical life as possible. Basically a biography in novel form. And yes, I agree, life was still hard even if they could get to the north. I remember Phyllis. She was one of my favorite poets in our American Literature curriculum. That second poem was very influential--especially in a society that wasn't always sure that black people had a soul. What a wonderful, articulate woman who accomplished so much in her short life, and rising from such circumstances. And another one that makes me feel like a total slacker. well, I'm definitely educated today but I'm glad that she is well known in some circles. How cool to find out more information and resources such as Freedom's Pen. I'm going to start The Call of Zulina myself - maybe tonight? Oh, Barb, you're so lucky. I did not hear of her in any of my literature classes. I agree, she was amazingly resilient. Barb, you are NOT a slacker. But I know what you mean. I feel like one, quite frequently. I actually thought it was Dina's post and was quite surprised at the end. Suzie, I'm late to the party, but had to add that I really enjoyed this story as well. I have a colonial story that deals with some tough issues regarding slavery. It was such a thorny issue even back then. I had heard of Phillis, but hadn't actually read any of her poetry. It is beautiful. And that statute is stunning! Hey there, Lisa. I wonder how loud I can shout, "Beta Reader!"? You ca, read my mind, right? I love the statue, too. It's beautiful. Like Deb, I'd like to see it someday. I had the name of the artist, and now can't remember. I think it was Meredith. I will check and come back and tell you. Meredith Bergman is the artist. I did some checking, and there are two other statues in the memorial. They are Abigail Adams (one of my heroes) and ... Lisa, are you reading this? 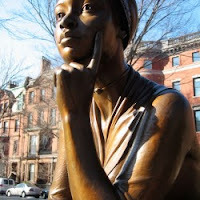 ... Lucy Stone. Awesome. Now I really, really would love to see the sculpture. Suzie, thanks for sharing Phillis' amazing story. Her life was incredibly difficult yet she was still able to nurture her creativity and write beautiful poetry - very inspiring! Lisa, I'm up for that road trip, as long as it's not winter time. I'd love to visit Boston. Can we go to Fenway while we're there? Please?